uuid : aba50536-2c7a-40df-b18a-1f4ddf583f24 templates_id: 119536 templates_uuid: "fd644627-638d-422e-8c71-ec809acbbf17" title: "Sale of Personal Goods Contract - Create a Sale Contract for Goods" display_name: "Sale of personal goods contract " meta_keywords: "Contract for sale of goods without warranties" description: "
Ensure the sale of your personal goods is recorded in a formal, legally binding contract with this sale of personal goods contract. This sale of goods contract will help protect the seller who is a private individual who wishes to sell an item. It covers the sale of goods which are owned by the seller, the description of what is to be bought, and the price, including delivery fees. This sale of personal goods contract is governed by the law of England and Wales.
" created_timestamp: "2018-10-08 04:36:44.0" modified_timestamp: "2018-10-08 04:36:44.0" active: true created_by: 102 modified_by: 102 dcm_id: 296 url_slug: "Sale-of-goods-contract-(private-individual)" meta_description: "Prepare a sale of personal goods contract to sell your personal possessions with help from Rocket Lawyer. Ensure that the sale is protected and recorded in a formal, legally binding contract. Try this sale of personal goods contract." time_to_complete: "10 minutes"
More than just a Sale of personal goods contract template, our step-by-step interview and guidance makes it easy to create your document. Easily create online, download, print and sign your free Sale of personal goods contract in minutes. 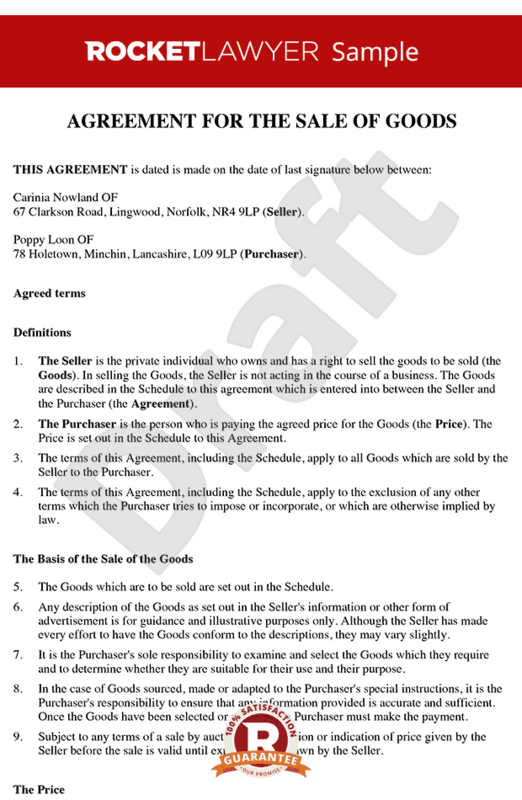 This document is also sometimes called: Contract for sale of goods without warranties.